The U.N. Human Rights Council since 2006 has been an important arm of the United Nations in recognizing and helping to enforce international human rights norms in the world. One of the ways it does this is its “Universal Periodic Review” (UPR) of individual U.N. member states. The UPR process involves (a) the state’s submission of a report to the Council, (b) submission of written questions and recommendations to the state from other states and stakeholders (human rights NGO’s, etc. ), (c) a hearing by the Council, (d) the preparation of a draft report on the state by a Council working group, (e) the state’s comments on that report, (f) another hearing before the Council and (g) the Council’s adoption of a report on the outcome of the UPR. In August 2010 the U.S. submitted its first UPR report to the Council. Three months later the Council considered this report and other documentation. The hearing for this UPR was held on November 5th in Geneva, Switzerland, and on November 9th, the Council debated the outcome of this UPR. The U.S. was represented at these meetings by high-level officials of the State Department and of other departments. establish an independent national human rights institute. On March 8, 2011, the U.S. submitted its written response to this final report. Ten days later (March 18th), the Council held its final hearing [paragraphs 721-56, 772] on the UPR of the U.S. The U.S. supports recommendations concerning improving civil rights and anti-discrimination. It noted that the U.S. had adopted the Don’t Ask, Don’t Tell Repeal Act and that the Department of Justice had established a Fair Lending Unit and had increased its enforcement of laws prohibiting discrimination in voting, employment, public accommodations and education and hate crimes. With respect to recommendations about criminal justice, the U.S. continued to work to ensure protection of the rights of detainees and inmates in its jails and prisons, and the State of Illinois had abolished the death penalty. With respect to the rights of indigenous peoples, the U.S. committed itself to improve tribal consultations, and in December 2010 President Obama announced U.S. support for the U.N. Declaration of the Rights of Indigenous Peoples. With respect to national security, the U.S. stated that it abides by all applicable law, including those respecting humane treatment, detention and use of force and will not tolerate torture or inhumane treatment of detainees wherever they are held. The U.S. also has reiterated its intention to close the Guantanamo Bay detention facility and its commitment to not treat entire communities as a threat to national security based upon their race, religion or ethnicity. The U.S. also announced the Administration’s intent to adhere to the humane treatment and fair trial standards of the Additional Protocol I to the Geneva Conventions and to seek the advice and consent of the U.S. Senate to U.S. ratification of the Additional Protocol II to the Geneva Conventions. With respect to immigration, the U.S. was accepting many of the recommendations, was reviewing its handling of “emergent” immigration cases and was improving immigration detainee access to medical care. With respect to economic, social, cultural and environmental rights, the U.S. noted that it had established a commission to examine disparities in educational opportunities and address children’s needs in distressed communities and that it had made grants to support health centers and improve access to health care by the uninsured. The U.S. has long been a leader in fighting against human trafficking and recently had launched a media campaign in Mexico and Central America with information on the dangers of human trafficking and how to avoid becoming a victim. The U.S. also was a leader in workplace protections and was strengthening efforts to respond to gender wage differences and to educate the public about the civil rights of immigrant workers. The U.S. was committed to a robust domestic implementation of its international human rights obligations. The U.S. also had “pushed” for Senate advice and consent to ratification of a number of human rights and other treaties, including Protocol II to the Geneva Conventions. But in its written comments on the recommendations the U.S. specifically rejected the recommendations that the U.S. ratify the ICC’s Rome Statute. The Council then adopted without a vote its working group’s report on the outcome of the UPR of the U.S. Note that the Council did not make any factual findings or determinations of violations or recommendations. It merely facilitated the process. In addition to the final Working Group report and the U.S. response thereto, the written record for the UPR of the U.S. included (a) a report by the U.S. itself; (b) the U.N. High Commissioner for Human Rights’ compilation of information about the U.S. from the reports of human rights treaty bodies, special procedures and other U.N. documents; and (c) submissions from 103 “stakeholders,” including human rights NGOs. The submission by a coalition of U.S. human rights NGOs on the subject of immigration and asylum was prepared by Minnesota’s Advocates for Human Rights. Finally it should be noted that from 2006 through 2008 during the George W. Bush Administration, the U.S. did not participate in the Council’s activities, but since then in the Obama Administration it has done so. This includes the U.S. seeking membership on the Council in 2009 and being elected to such status for a term that ends on December 31, 2012. Protocol II to the Geneva Conventions was submitted to the U.S. Senate on January 29, 1987, by President Reagan, and on March 7, 2011, President Obama urged “the Senate to act as soon as practicable on . . . Protocol [II], to which 165 States are a party. An extensive interagency review concluded that United States military practice is already consistent with the Protocol’s provisions. Joining the treaty would not only assist us in continuing to exercise leadership in the international community in developing the law of armed conflict, but would also allow us to reaffirm our commitment to humane treatment in, and compliance with legal standards for, the conduct of armed conflict.” Nevertheless, there has been no actionwhatsoever on this treaty by the Senate Committee on Foreign Relations or the Senate itself in the 25 years after its submission to that body. This is not surprising given the political composition of the Senate and the constitutional requirement for a two-thirds (67) vote for the Senate to give its advice and consent to ratification of a treaty. 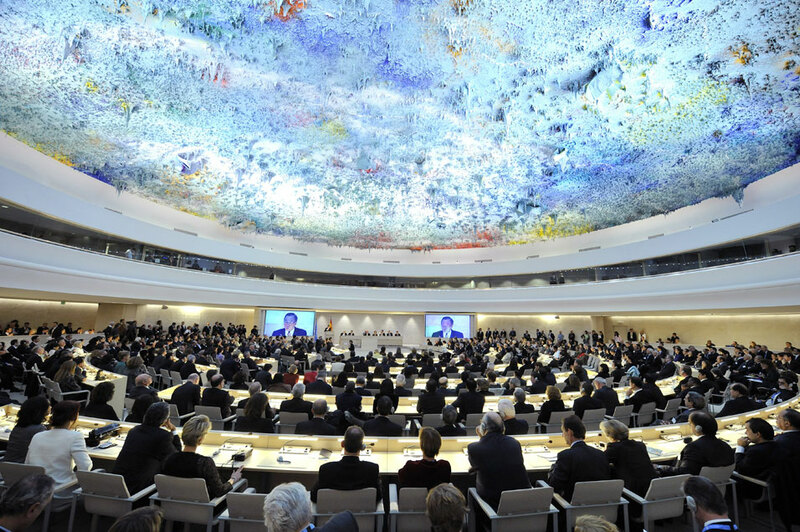 The Universal Periodic Review (UPR) is a well-thought innovation of the human rights council. It ensures the steps taken by all states to promote human rights and encounter challenges. It can only achieve its goal of improvement of the human rights situation in every country if it treats all members equal and help them overcome challenges.